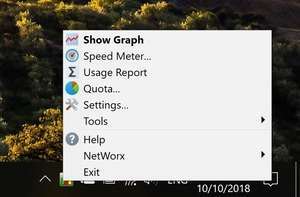 Checking your connection with some of the Windows tools is not always thrilling, that's why programs like Networx exist. This is a free network tool for check your system bandwidth. This application includes a suite of different tools which can control and monitor the behavior of your Internet connection. They can all be accessed from the system tray. Version 6.2.4 is a freeware program which does not have restrictions and it's free so it doesn't cost anything. For security reasons, you should also check out the NetWorx download at LO4D.com which includes virus and malware tests. Additional screenshots of this application download may be available, too. Auditing tools provided for free download include those used by network administrators across the world in order to sniff packets and improve network security. Reviews are included by the editor along with free software download. Check out some of the freeware downloads available in the network auditor category. They contain no strings and are available at zero cost. 4 out of 5 based on 56 ratings. This file download is licensed as freeware for Windows 7, Windows 8 (64-bit, 32-bit) / Vista / XP.